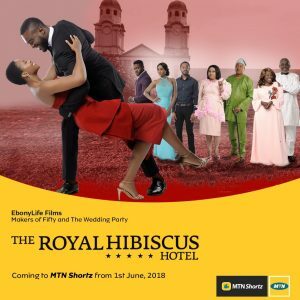 Lagos, 4 May 2018 – EbonyLife Films, producers of Fifty, The Wedding Party and The Wedding Party 2, is excited to announce that its latest production, The Royal Hibiscus Hotel (RHH) will be available digitally, on the MTN network, via MTN Shortz, from June 1. Using a short code, subscribers will be able to access the film at their convenience, for a significantly reduced cost – less than the amount needed to get airtime and mobile data. The film’s release on other networks will follow in the coming weeks. This is good news for the millions of MTN customers without access to a cinema. Starting in June, they will get the chance to enjoy a high-quality, romantic comedy like no other in Nollywood. Mo Abudu, Executive Producer, is elated about this development. “The digital debut of RHH is an exciting step for us and we are glad to have a second Nigerian release – scores of moviegoers have already watched and enjoyed it in theatres. However, making it easily accessible on mobile networks, starting with MTN, gives more people the opportunity to see it, at a fraction of the cost of a cinema ticket or two,” she said. The Royal Hibiscus Hotel is a heartwarming and charming rom-com that people of all ages can relate to. It tells the story of ‘Ope’, a struggling Nigerian chef in London who moves back to Lagos and discovers that life can be full of surprises. The film stars Zainab Balogun, Kenneth Okolie, Deyemi Okanlawon, Kemi ‘Lala’ Akindoju, Toni Tones and O.C. Ukeje, with veteran actors Rachel Oniga, Jide Kosoko, Olu Jacobs and Joke Silva. Judging from the reviews it has received since its cinema release in February, audiences who decide to watch the movie on their mobile devices are sure to be delighted. There are storylines guaranteed to make them laugh, cry or cheer for their favourite characters.